Our Mother served as a cadet nurse from October 2, 1944, to January 2, 1946, in Washington, D. C. She was stationed at Providence Hospital Nursing School, a division of Catholic University of America, Washington, D. C. The Cadet Nurse Corps was under the Federal Security Agency, U.S. Public Health Service, Division of Nurse Education. Cadet Nurses trained in military uniform to become commissioned officers in the military services. 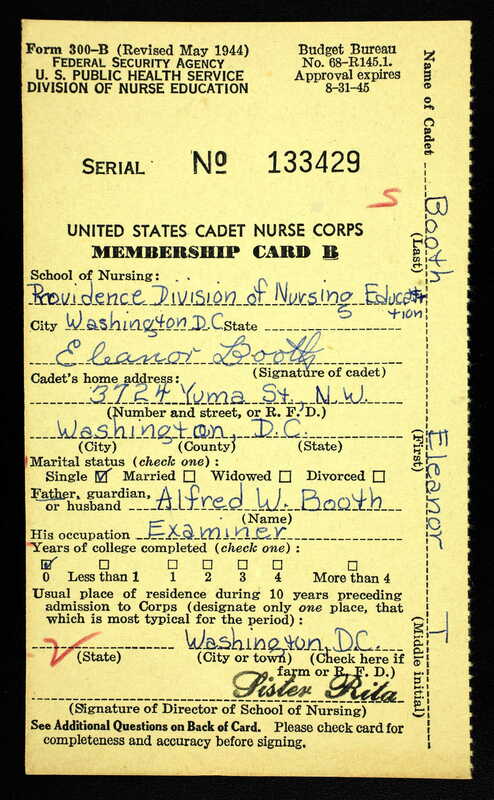 Eleanor was so enthusiastic about joining the Cadet Nurse Corps that she entered the corps at age 17, having worked hard to graduate from Woodrow Wilson High School early. She had been dancing ballet for the Washington Ballet Company also and sacrificed her dancing career to serve the war effort as a Cadet Nurse. She fulfilled her Cadet Nurse Oath by serving until the duration of the war. Subsequently she married Bob Oversby, had five children, and retired as a school teacher, and now lives in Bryan, Texas, with her husband, Hugh. She still loves to practice her ballet and piano. She is also memorialized on the World War II Memorial web site.